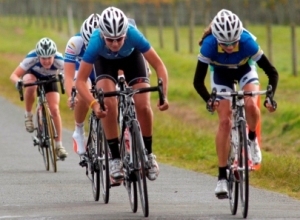 Alexandra’s Sophie Williamson edged out Wanganui’s Cassie Cameron in a sprint finish to win her second national title of the week the under-19 race at the RaboDirect Club Road National in Hawkes Bay today. The pair, both medallists in last year’s world junior track championships, are using the road to prepare towards this year’s world event to be held on home turn in Invercargill in August. “I love racing. I find it brings me up well,” Williamson said. “That was pretty close though. Williamson heads to the USA in June to race and train in Milwaukee and Pennsylvania before heading home for the world championships. Dunedin’s Reta Trotman gave up attending her university graduation today but she has well and truly graduated to the top echelon of cycling in this country with victory in the Elite Women's race. The 23-year-old was to graduate from a degree in nutrition to add to her physical education degree. But she showed she had the right formula to beat off a talented field including the Olympic track cycling quartet of Alison Shanks, Jaime Nielsen, Rushlee Buchanan and Lauren Ellis. Trotman, a former national gymnastic representative, did more than her fair share of hard work, going clear for nearly half the race in a two-strong break. The Olympic trio of Shanks, Nielsen and Buchanan dragged two others up to the leading pair in the final of four laps in the 116km race over a testing circuit near Taradale. Rather than wait for the final sprint, Trotman attacked again up the hills, receiving some help from Otago clubmate Shanks as the young rider remained clear to win in 3:13.30. Shanks won the sprint for second in the chasers 50 seconds back ahead of talented young North Harbour prospect Georgia Williams. “The plan was to do a lot of work, may be not that much but in the end I got there,” said Trotman. “I promised myself that I would attack on the hills no matter what because I don’t have the speed of those track girls. I kept to my promise. It was awesome. “I really put it down for about 10 hard strokes and looked back and couldn’t believe there was no-one there. Ali was awesome. I was on the inside and she held them up and dropped the pace at the start of the hill a little bit which was great for me. Trotman was fourth in the national elite road championships and fifth overall and first New Zealander in the international Tour of New Zealand. It was a good hit out for the Olympic-bound track team, who mixed racing this week with training and major planning sessions before they head to the USA to begin their concerted build-up for London. Earlier former Commonwealth Games medallist Gordon McCauley edged out Auckland’s Aaron Strong to win the Masters 40-44 years race over 116kms, to reverse their result in the time trial earlier in the week. The championships finish tomorrow with the senior men’s race over 177kms. Masters 40-44, 116km: Gordon McCauley (Department of Cycling) 2:50.02, 1; Aaron Strong (Auckland Central) same time, 2; David Rowlands (Port Nicholson Poneke) same time 3. Under 19, 87km: Sophie Williamson (Central Otago Wakatipu) 2:36.09, 1; Cassie Cameron (Wanganui) same time, 2; Alice Hay (Pegasus) same time, 3. Masters 45-49, 58km: Sheryl Duncan (Taupo) 1:40:20, 1; Patricia McBreen (Gisborne) 1:40:20, 2; Fiona Southorn (Marsden Wheelers) 1:48:25, 3. Masters 50-54, 58km: Sue McMaster (Bike Manawatu) 1:40:19, 1; Dianna Borman (Kapiti) 1:40:19, 2; Bridget Ray (Hamilton City) 1:40:19, 3. Masters 55-59, 58km: Lesley Mouat (Athletics Masterton) 1:47:29, 1; Ann Rigg (Tasman Wheelers) 1:50:46, 2; Jan Brosnahan (Cycling Otago) 2:05:02, 3. Masters 60-64, 58km: Susan Tunnicliff (Ramblers) 1:50:00, 1; Diane Tisdall (Counties Manukau) 2:12:08, 2;. Masters 65-69, 58km9: Lesley Parton (Marsden Wheelers) 2:23:24, 1.